The host peter is awesome always going out of he's way to behelp any way he can and he was always so nice to my grandma really appriciated it awesome owner and waitress too great service 5 stars. I go to Gateway Cafe several mornings a week. Peter (owner) is so friendly and and the waitresses are the best. Their food, service and atmosphere is unmatched, as well as, the repeat business!! Great spot for meetings and all friendly gatherings. 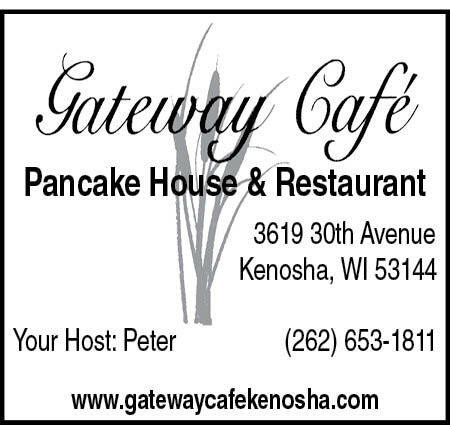 The best food on North Side of Kenosha. Service is excellent, proportions are large and include, soup or salad, bread, entree, dessert. The staff are personable and caring. As one who eats there every night I recommend this to anyone seeking homemade food. It's a busy hub of a restaurant, whether for breakfast, lunch or dinner they always serve good food with a courteous smile. You are never rushed to leave. Great meeting place for groups of friends.